I hope you are having a superlicious, holiday weekend! Thank you so much for coming by and joining in this super fun hop! It’s all about the sweetness of life! If you have arrived from Jani’s blog then you are in the right place! If you would like to start the hop from the beginning, then please head over to Angie’s blog and follow along! Many thanks to Yolie for coordinating another super sweet hop! ALSO...be sure to send one of our bloggers some birthday hugs....It is Ms. Tammy's BIG SWEET DAY! Happy, Happy Birthday Tammy! So here are my projects for today! Here is a photo of the entire layout. 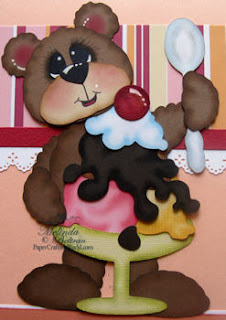 Here is close up of the little bear and his yummylicious sundae. Here is a close up of the two ice cream cones. This project is available as a kit for those that don’t have an electronic die cutting machine. CLICK HERE for details. Here is a close up of my second kit. It is a cute little bear with her cookies. This project is available as a kit for those that don’t have an electronic die cutting machine. CLICK HERE for details. Here is a close up of the little girl bear paper piecing. Here is a close up of the little bear but with “boyish” features. You can get some cute Digital Stamps or Cutting Files! 1. Be sure to become a follower of this blog. I will randomly select a winner and announce them next Friday with our weekly challenge winner announcement! Next blog on the hop is the super talented Norma. Be sure to head over and check out all the sweetness she has for you! Thank you so much for stopping by, please go through the hop and enjoy all the rest of the scrumptious sweet projects! Oh this is just scrumptious!! LOVE HIM!!! and want him!!! Super Job Melin!! Wonderful. Like the Bears in the layouts. These are just too cute!! I love! Both layouts are just so darn stinkin cute! I just adore both of them so much! OMG!! so CUTE!!! Love the layouts!! Fabulous SWEET!! Love these little creations you do! Adorable creations as always, Melin. I just love all the shading and highlights you added. You just make them pop! Your layouts are so adorable. Stopped by last evng before hop started since you had your hop post up. Now stopping by as I began hop & continuing along on hop today. Enjoying the sweet treats. OMG...all I can saw is I totally love it. You're inking for the shadowing is exquisite. I LOVE LOVE both layouts. I love die cutting and I love seeing a story come together like this. my blog creatingincarolina.blgosot. I am becoming a follow. Can't believe I'm not already. Both layouts are so super cute!!! I love em!!! I am already a happy follower of yours. Wow, those are fantastic layouts. Love the bears, thanks for sharing and for the chance to win! love your layouts!! TFS! thanks for the opp to win! Mmmmm!!! Just full of yummy goodness!! yummy and cute layouts tfs!! Have a super sweet weekend. What an adorable LO. I love the little bears they are so cute. Thanks so much for sharing your beautiful projects. Those bears are too cute. and your layouts are nice and simple. I like that it doesn't have too much 'stuff' on them. your layouts are fabulous. You put so much time and effort into them. I love coming over and checking out what you've done lately and this is the best. What super duper adorableness. Your LO's are ALWAYS so delightful. TFS and for being part of this fun hop! Both your projects are adorable! Thanks for sharing!! Melin, both of your layouts are absolutely BEAUTIFUL -- Of course, I'm always so impressed with your wonderful creativity and designs!! What a SWEET TREAT to hop with you!! ACK! So cute. LOVE the cookie monster! Your layouts are simply adorable. Everything looks so yummy. How about that cookie. I love, love, love your layouts! As usual you did a great job. TFS. Scrappy hugs my dear. Oh my goodness. They are so beautiful. Those bears are amazing! Both layouts are great!!! they make me smile!!! Wonderful layout, Melin!!! I love the adorable bears! Your work is always so precise and well executed. It's just a joy to see. Thanks for the inspiration and the chance to win. You create the best layout....love them! Now this is one adorable layout!!! And he is so deliciously cute that it's not even funny!!! Melin, both of these layouts are so fabulous!! I can't decide which I like better! Thanks for the wonderful Birthday wishes, y'all have made my Birthday so special! !